ATV Parts, ATV Radiator Kits, ATV Wheels Tires, ATV Suspension Springs Shocks Bumpers - Wild Boar ATV Parts > Radiator Relocation Kit > Kawasaki Brute Force 05-11 650i/750i Radiator Relocation Kit Rebel Flag Plate $145.00 FREE SHIPPING!! « Polaris Sportsman 700 & 800 Rebel Flag Face Plate Complete Kit 04-up $145.00 FREE SHIPPING! ON SALE NOW for $145.00 includes FREE SHIPPING! Includes everything you need to install to get you out on the trails! This is a steal at this price. 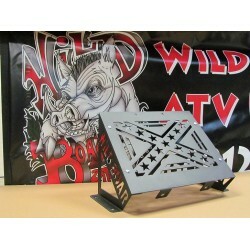 These Wild Boar Radiator Relocation Kits won’t last long at this price!